Earlier this month, Sudipta was featured on Nerdy Book Club! Our plan was to reblog my NBC post on the same day, but the plan escaped us! Last night Nancy Drew came up on #kidlitchat and reminded me to share this today! Happy Reading. I think I was in third grade when I discovered Nancy Drew on a bookshelf at my grandmother’s house. 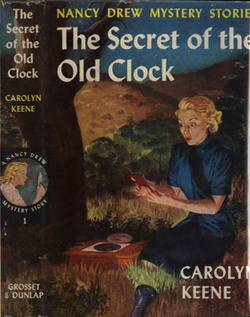 The book, Secret of the Old Clock, had been my mother’s, and it had a solid blue cover beneath a colorful dust jacket. As soon as I read it, I was hooked. It was a thrilling moment, a week or so later, when my mother took me to the library and pointed out an entire bookcase FULL of Nancy Drew mysteries… a bookcase FULL of cheerful yellow spines… spines holding pages that would occupy me for hundreds of hours to come. I loved how smart Nancy was, and I loved turning the pages to find out the WHO, WHAT, WHEN, WHERE, WHY and HOW of each mystery. The books that brought their magic to my childhood. Thanks Kami.